Green Vitality™ is a synergistic blend of the four-premium quality, ecologically grown, super green foods. It provides the health benefits of spirulina, cereal grasses (wheat grass and barley grass), and chlorella all in one. The ingredients in Maxi Green Vitality™ contain phytonutrients and phytochemicals to provide exceptional nutrition. Cereal grasses we use are wheat grass and barley grass. They are planted in the fall and grow through the winter making them nutritionally superior because they grow slowly and develop naturally in an ideal climate. Chlorella acts as an antioxidant. It also supports digestion and the growth of beneficial live bacteria in the gut. 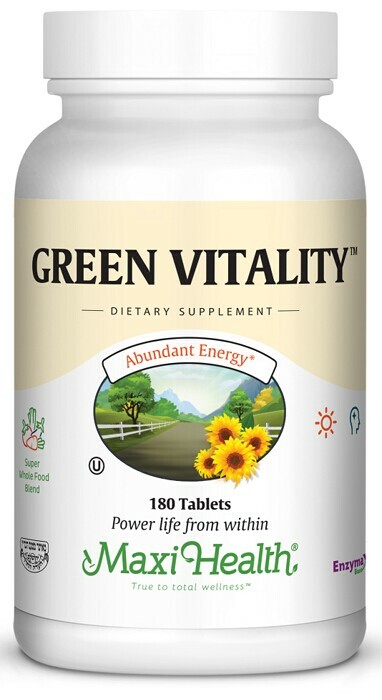 Try Green Vitality™! Feel the difference! Take up to six (6) tablets twice daily, or as directed. Other Ingredients: Microcrystalline cellulose, stearic acid, dicalcium phosphate, Enzymax® (calcium carbonate, bromelain, papain, lipase, amylase, protease, silica), croscarmellose sodium, aqueous film coating.